What a difference a flight out west makes. When the Phillies arrived in San Francisco yesterday, they had been in a rut, dropping two straight to the lowly Miami Marlins, including an embarrassing 14-2 loss on Sunday. Now, for a second straight night, they got a dominant performance from their starting pitcher on the way to a victory. This time, Kyle Kendrick was the responsible party, easily dispatching the Giants lineup in a 6-2 victory that never seemed in doubt. Coming into tonight’s game, Kendrick led Phillies starters with a 2.43 ERA. Dating back to July 1, his ERA is a pristine 2.57. He’s been dubbed the team’s stopper–albeit with a tongue in cheek connotation–for a reason. He’s pitched like a true ace. Combine his recent run of success with his 1.89 career ERA when facing the Giants–his lowest against any National League opponent–and his final line would be no surprise: 7.0 IP, 6 H, 2R, 2 ER, 0 BB, 6 K. These stellar outings from Kendrick are becoming commonplace. He was in control all night, rarely getting into trouble and finding a way out whenever he did. KK was particularly impressive in the fourth. After allowing two in the third, the fourth frame began with an ominous tone for the 28-year old. Buster Posey led off with a single. That was followed by an error by Michael Young on a dead doubleplay ball. With two on, no outs, and a tight one-run ball game, Kendrick was in hot water. No matter. Pitching like a seasoned veteran with ice water in his veins, Kendrick calmly struck out the next two hitters before getting the third out on an easy groundball. Lord Kendrick giveth; Lord Kendrick taketh away. The Phillies offense caught an early break when Tim Lincecum misfired to first trying to retire Chase Utley on a slow dribbler up the first base line. On replay, it was obvious that Utley was out of the baseline and should have been called out, but the umpires deferred, and Utley wound up on second. He’d come around to score on a Ryan Howard single for an early 1-0 lead. The small ball approach was a theme at the outset. The Phils scored two more runs in the early innings, one on a groundout and the other on a single up the middle. That’s not to say the Phillies didn’t have a good approach. Through three, Lincecum had sixty pitches. They weren’t retired in order for the first time until the sixth. They made Lincecum work all night. And even though Timmy isn’t the same pitcher he once was, it’s always a positive to see this team with a solid offensive night against a pitcher who traditionally does well facing them. For the second night in a row, Utley went deep into the San Francisco night. His homer tonight traveled over 420 feet to the deepest part of spacious AT&T Park. It was Utley’s 7th home run of the season, which leads the team. Though Utley’s average has dipped a bit following his torrid start, he is still producing at an elite level. If he keeps this up, the Phillies will have to make a very interesting decision on whether to retain his services following this season. Howard also checked into the home run department, clubbing a solo shot in the ninth for an insurance run. The homer was Howard’s sixth of the season, as he tries to keep pace with Utley. – During tonight’s game, the Phillies announced that Tyler Cloyd would be starting in place of the injured Roy Halladay on Friday in Arizona. Last year, Cloyd started six games for the Phillies and posted a 4.91 ERA with 30 strikeouts and seven walks. No corresponding move has been announced yet. 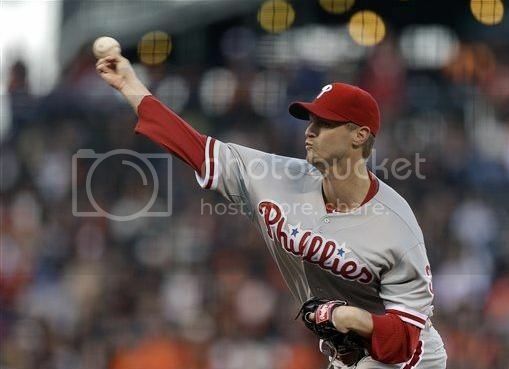 – Speaking of Halladay, the Phillies had no news on his sore shoulder, which was examined in L.A. earlier today. Keep an eye out for an update tomorrow. – The Phillies close out their series in San Francisco tomorrow afternoon when Jonathan Pettibone (2-0, 3.24) takes the hill. The resurgent Barry Zito (3-1, 3.06) takes the ball for the Giants.